We don’t just say we are the #1 water ionizer company. We prove it! We have sold many top brands water ionizers(Kangen Enagic, Toyo, AlkaBlue, Nexus, KYK, Tyent, Life Ionizer EmcoTEch, BionTech) and think all the top water ionizer models(no matter the brand) make good alteration to water. The similarity ends there. The differences are in water filtration power, technology , sophistication & design(i.e. :SMART electrodes & DARC II electrode cleaning systems,AutoAdjust optimal performance with low power ), manufacturing quality and durability. Our unique focus is on the importance of clean water. AlkaViva’s UltraWater filter performance (and testing ) is unique . We are the only company who represents two top manufacturers offering water ionizer models that fill different niches. We offer you the best of the best – in water filtration, water ionizer performance, electrodes , electrode cleaning system & durability and customer experience. That is choice. That is smart. EmcoTech is sold in over 60 countries, the most popular and best-selling brand water ionizers in the world. A water ionizer is a serious investment, so who you buy from is important. AlkaViva is the oldest direct importer in the USA. Between our two founding partners you get over 30 years of USA-specific water ionizer industry expertise. Virtually all our USA competitors started with us as dealers including Life IonizersTM, Tyent, Echo and Chanson.We have helped develop and launch major new water ionization technology that have been emulated by many others, such as MESH electrodes/plates and MARC/DARC improved electrode cleaning systems. We have been instrumental in launching and supplying water ionization components for commercial applications. Most notably, we supply Tennant Company, water cells for their Ec-H2O floor cleaning product line. Ec-H2O was the first commercially successful application of water ionization technology and has won numerous international awards. Together, our OEM partners offer 69 years of water ionizer manufacturing. They both hold ISO 9001 and 14001 certifications, own patents too numerous to list, and have won many awards for their business practices and products. Both are firmly rooted in ongoing research and development and in quality management practices. You can trust that our history, experience, knowledge and partnerships allow us to source top performing products from the best manufacturers in the world. Manufacturers that carry the best certifications and the latest cutting edge technology in water ionizers- ensuring you will make the best purchase. AlkaViva was the first company to launch MESH electrodes. Robotically sprayed platinum coating technique that results in precise and highly uniform electrode surface. Introduced the new Smart Electrodes which deliver the highest efficiency and performance in producing ORP and H2 alteration. The only company to offer proprietary membrane technology. AlkaViva introduced the first automatic reverse cleaning system – MARC with Melody jp104 water ionizer. A single reversible motor driven system that creates a 1:1, acid to alkaline cleaning ratio, to protect water ionizers from damaging scale build-up. It eliminates the need to wait during cleaning. Launched DARC the first dual solenoid-driven automatic reverse cleaning system with the highly effective 1:1, acid to alkaline cleaning ratio, with no wait for ionized water while cleaning – in Athena JS205 and Delphi IO 400 U water ionizers. have other water companies implemented at least MARC electrode cleanse or do they require manual cleanse on a regular basis? First water ionizer company to offer USA-made (non-Asian) water filters. First water ionizer filter capable of handling chloramine and heavy metals. First multiple media-bed water ionizer filter. Launched the first dual water filter ionizer model. 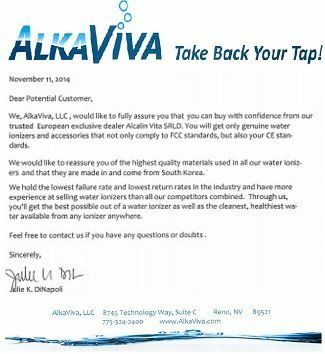 The only water ionizer manufacturer to offer onboard (internal) scale inhibiting technology. More external water prefiltration/ pretreatment options to handle a wide range of unique water quality issues. The first water ionizer manufacturer in USA to offer non-electric water ionization technology. The first and only company to offer third-party EPA certified lab test results against 172 contaminants (reducing virtually all of them by 99.9%). The first and only company to offer third-party EPA certified lab testing for water ionizer performance. The first to offer a dedicated under sink water ionizer model with remote tower. The first to offer color LCD screens to identify the selected water type. The company with the longest history as an exclusive importer (since 2004 with Emco Tech). The only Better Business Bureau accredited company with a 15- year track record as A+ rated.